I got out my 4 quart crockpot, 3 pints of blueberries, 1 cup of sugar, and 1 tbsp of lemon juice. 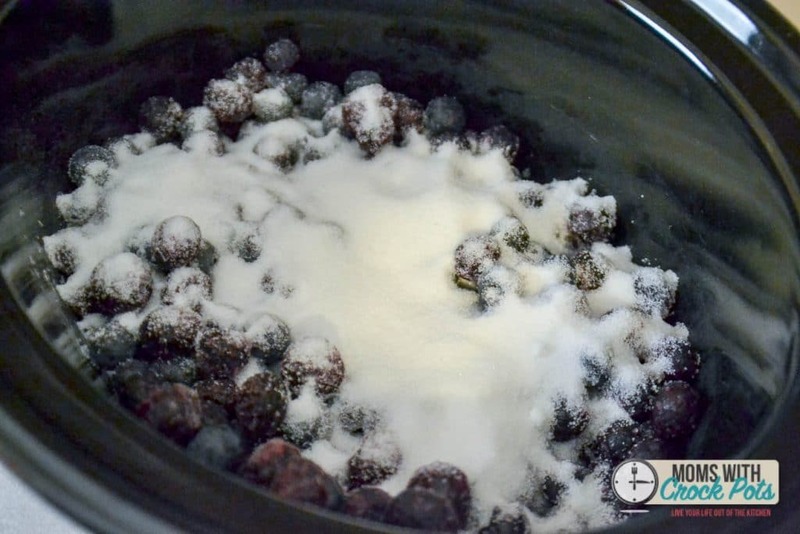 After thoroughly washing the berries they went in the crock pot with the sugar and lemon juice. You can totally use frozen blueberries for this too. I have done that in the past and it turns out amazing. Cook it on high for 3 hours. As the blueberries get hot they burst open creating a juicy syrup with the sugar. Now if you want your syrup with out bits and pieces of blueberry now is when you will toss it in the blender or use an immersion blender and puree it. If you like little chunks of fruit in your syrup (which is how I like it. Just use a potato masher or a back of a fork to make sure all of the blueberries are broken up. Cook on high for another 30 minutes without the lid. 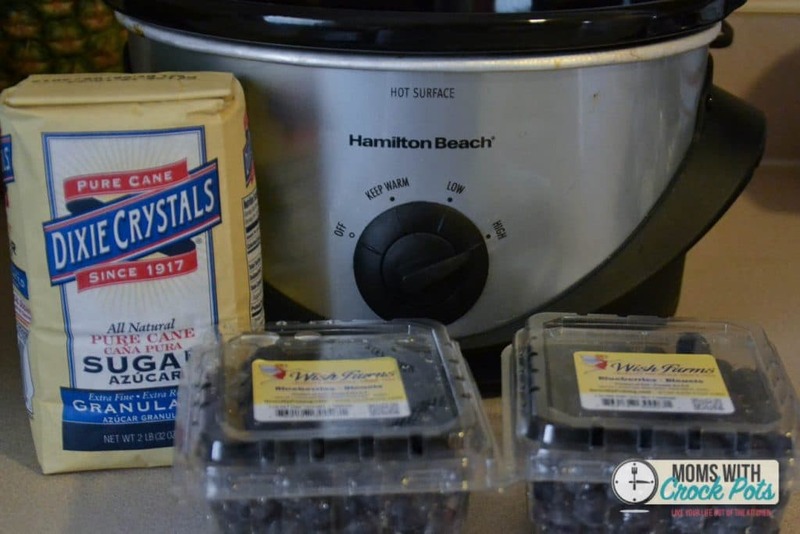 I ended up with 3 jars full of this delightful CrockPot Blueberry sauce! Place all of the ingredients in the crock pot on high for 3 hours. If you would like your sauce without chunks use a blender or animmersion blender to puree. Otherwise, use a potato masher or the back of a fork to make sure all the blueberries are mashed. Return to, or leave in crockpot for another 30 minutes with the lid off. Place in jars and refrigerate until ready to serve. You can use a hot water method to can this syrup to make it shelf stable. For more info see here. You don’t need any pectin to thicken this? No because this is a syrup not a jam or preserve. 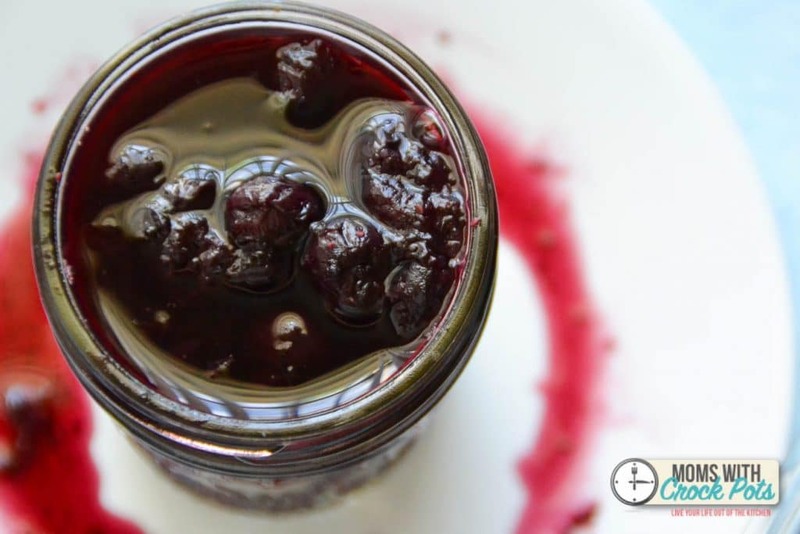 You can add pectin to make this more like a jam/preserve. You would add the amount called for on the pectin package.